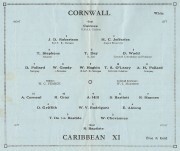 Cornwall County Football Association wish to express thanks to the Penzance Football Club for all assistance rendered in making this game possible. Four games involving County XI's have been arranged before competition games in the Southern Counties' Amateur Championship and in the South Western Federation start. The first two are at St. Austell on Tuesday, Sept. 1st, and Penzance on Thursday, Sept. 3rd, each game being against the Caribbean XI, and then follow two games at Bodmin and Newquay against a Combined Services XI and Mike Sterne's XI respectively. BAPTISTE, Rawlins Alexander. Goalkeeper. Very agile between the uprights, and much is expected of him during this tour. CHEVANNES, Walter George. A Jamaican, aged 27. He is an extremely clever full back and is at home on any side, right or left. DE LA BASTIDE, Tyrone Carl. Full Back. Born in Trinidad, age 21. Played for his village in Jamaica[sic], on the small side for a defender, he is nevertheless fast. Tackles hard and is quick to recovery. ALEONG, Edward Kelvin. Born in Trinidad, Age 22. A half back who is a good ball player, whose control is delightful to watch. RODRIGUEZ, William Vincente. Born in Trinidad, age 25. Balanced, cultured and an artist in the use of the ball, also a Cricketer has played for the West Indies against India and Pakistan. He also enjoys swimming and horse racing. GRIFFITH, Doyle. Half-back, Born in Trinidad age 27. Has played for Trinidad on numerous occasions including in this country. A tireless wing half. His strength lies in astute anticipation. HAYNES, Reginald F. Outside Right. Has represented Barbados and is more than useful as a winger, and a lot is expected from him. BARTLETT, Sydney Anthony. One of the youngest members of the team, he is no quite 21. An inside forward whose positional play is sound. HILL, Anthony George. Age 21. Can play in the centre or either inside position. Has visited the United States, and is now a student in England. GRAY, Ronald James. Born in England, now resident in Trinidad, he is 20 years of age. A clever player, who oftimes splits a defence. Very dangerous in the area with both head and feet. CORNEAL, Alvin Ainsley. Born in Trinidad 22 years ago. A very versatile forward. A good all round cricketer, he likes swimming, dancing and table tennis.